Mornings are a difficult time for some of us. You wake up, you have a lot of things you need to get done, your body needs attending to, and you generally have a very limited amount of time for yourself and your personal needs. And you’re definitely not at your best. You’ve just gotten off of a night’s sleep, so your mind may either be in the past, wishing you could go to bed, or in the future, thinking about all of the things you’re going to have to do for the rest of the day. The last thing you want to think about is cooking. I spent most of my life not eating a lot of breakfasts, even before low-carb high-fat eating. When I wake up in the morning, the last thing on my mind is food. Just the idea of trying to swallow something on an empty stomach feels disgusting. On top of that, when following a low-carb high-fat diet, one of the advantages and difficulties is that you don’t get very hungry. Now that my appetite is being suppressed by my low-carb high-fat eating, it’s even harder to find something worth putting down my throat in the morning. But eating breakfast is very important to maintaining an even blood sugar and a low appetite throughout the day, so it’s vital to come up with a set of easy, tasty, convenient breakfast foods that you can grab and eat. Ideally, every morning would start with freshly scrambled eggs in butter with a side of fatty pan-fried bacon. Very healthy, and definitely delicious, but a lot of work. You can’t rely on yourself to put that much effort in every morning. But there are a few foods that I’ve found are very convenient, and that I tend to go for in the morning for breakfast. One of the first go-to breakfast foods on my list is cottage cheese. Now I know many experts will say that cottage cheese has too many carbohydrates to be appropriate on a low-carb, high-fat diet, but stick with me. The way that I prepare my cottage cheese when I buy it is to take a container of cottage cheese, and a container of sour cream, and mix the two together. 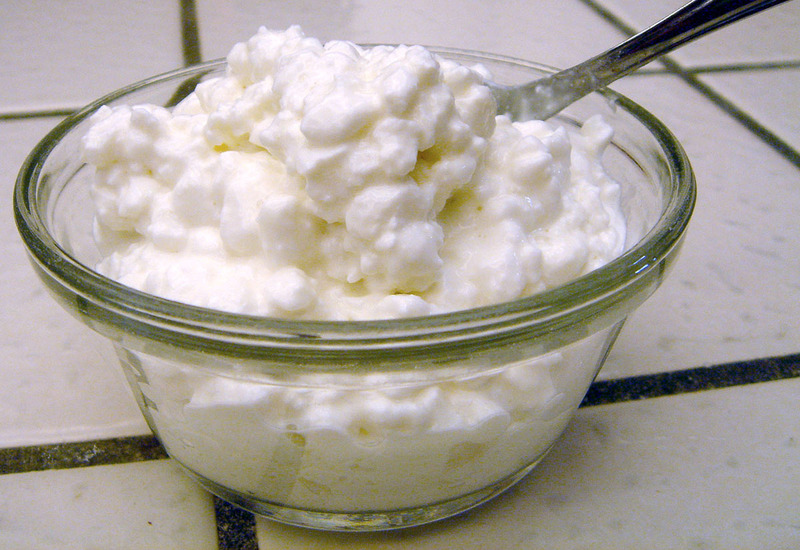 The bacteria in the sour cream start to consume the sugary lactose in the cottage cheese, and the extra fat helps moderate the impact of the remaining lactose. Like most fresh cheeses, the lactose can be an issue for some folks, but the impact on your blood sugar can be moderated by increasing the fat content of the food. Cottage cheese is also very versatile. In the mornings I need something that’s going to tempt me to eat. Sometimes it has to be something with a slight sweet tang, sometimes it has to be something more savory. Cottage cheese can go either way. Blended with sour cream, it becomes even more enticing. One of my favorite approaches to cottage cheese in the morning is to mix it with a little bit of cinnamon, a little bit of stevia (If I’m doing artificial sweetener), and some crushed nuts. The result slips over the tongue and down into the stomach easily. It also provides a lot of healthy saturated fat, has a moderate amount of protein, and can be thrown together very quickly. It’s just as easy to spice up your cottage cheese with a little bit of garlic powder, a dab of mustard, and even chopped fresh celery or onions if you’re feeling energetic. Another savory cottage cheese-based breakfast starts with a tablespoon or two of prepared tomato sauce, some oregano, and maybe some parmesan cheese for a pizza flavor. You can also put in some slices of pepperoni if you have some on hand. Even if you’re avoiding the fresh cheeses, don’t forget the harder aged cheeses. A block of cheddar, a block of Monterey Jack, a block of mozzarella, or even something more exotic like a camembert or a brie can be a great grab and go breakfast. Just chop off a hunk, and chow down. No need for any preparation work. Most low-carb high-fat kitchens should have a variety of cheeses on hand. Similarly, meat cold cuts such as salami, bologna, ham, and roast beef are very convenient. Check the labels when you’re buying them; most of these meets come processed with a bunch of additives that you may not want in your diet. But it’s not hard to find brands that are healthy, that haven’t stripped out all the fat, and that stay conveniently fresh and available in your refrigerator. I like to buy sliced cheeses and sliced sandwich meats, so I can grab a handful of each for breakfast. 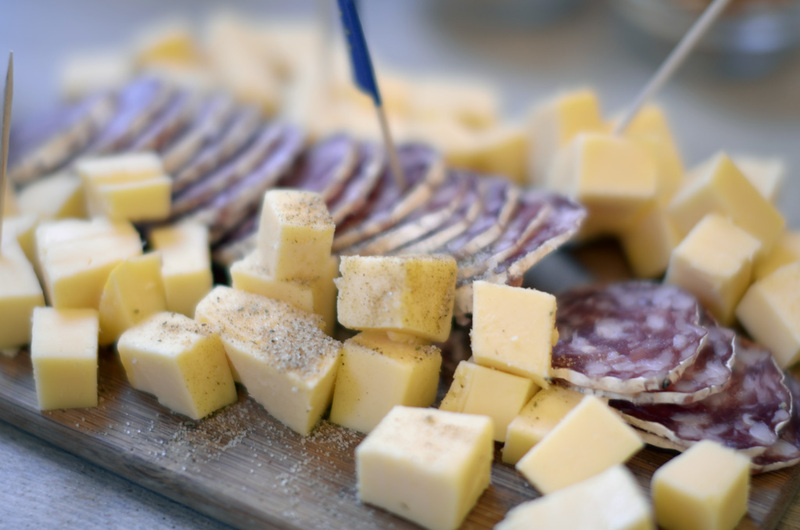 Wrap a little salami around some cheddar cheese, pop it in your mouth, and it’s instant hors d’oeuvres. Who needs the crackers? Another convenience a lot of people don’t think about is prepared bacon. Lately the grocery stores of been selling boxed prepared bacon, but it’s expensive, ridiculously thin, and just tastes salty and smoky without a lot of the bacon flavored that I’m used to from freshly broiled bacon. Besides, when you buy it prepared at the grocery store, you don’t get to fill your home with that delicious cooking bacon smell. It’s actually very easy to slap a few slices of bacon onto a sheet of foil and pop it into the toaster oven at 350° for 12 minutes while you’re brushing your teeth or taking a shower. Pour off the excess fat into a jar for cooking later, and just snack down on those tasty bacon slices. And don’t forget that bacon is preserved meat. 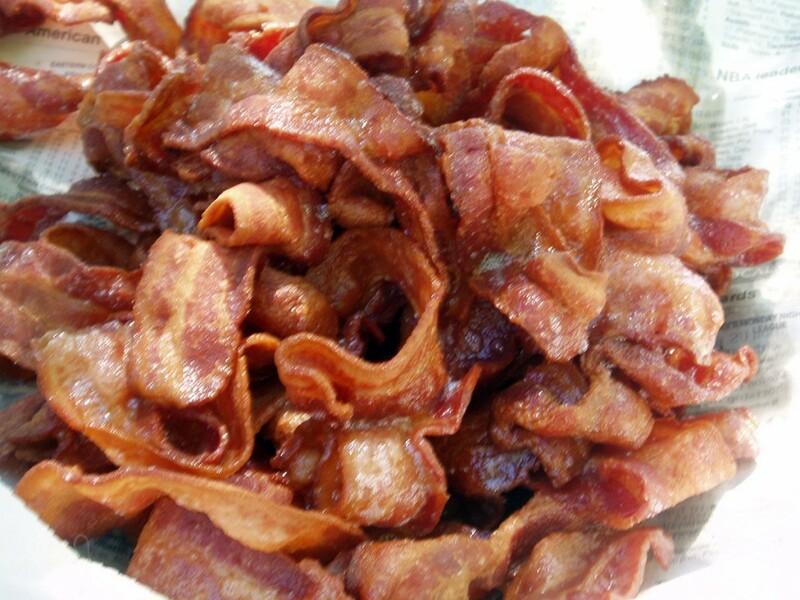 If you want to make some extra, bacon keeps very well wrapped loosely in foil in the refrigerator. And it’s surprisingly tasty cold. When you’re ready for a snack, just open the refrigerator and pull out a strip. The little globs of congealed bacon grease are delicious, and they’re a good fat supplement for your diet. Since were talking about bacon, it usually goes very well with eggs. 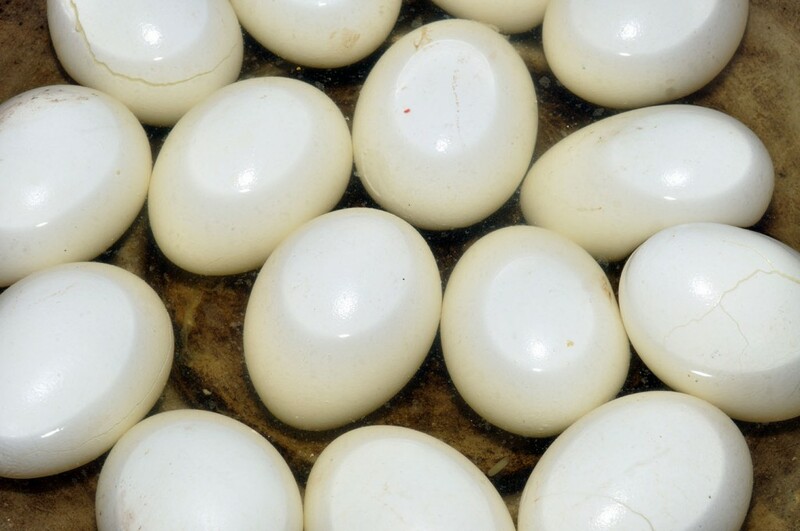 Hard-boiled eggs are great to keep on hand in the refrigerator. Some people say they’re kind of hard to peel, but I’ve discovered the trick; start at the wide end and crack it open, and then make sure that you peel under the membrane that surrounds the egg beneath the shell. As long as you get under that membrane, the rest of the shell will come off very easily. And a hard boiled egg or two with a little bit of salt and maybe a dollop of mayonnaise or mustard is an excellent low-carb high-fat breakfast. If you’re fortunate enough to have a sous vide machine, simple eggs can become a real delicacy. With a sous vide, you can prepare a batch of soft-boiled eggs easily to use as breakfast foods or just convenient snacks. The sous vide cooks them at the exact temperature that will make the yolk creamy and the whites slightly soft, perfect to eat with a little salt and a spoon out of an egg cup. You can easily make a half dozen of them in advance, and then eat them cold or warmed up in a little boiling water (no more than a minute) whenever you’re ready. You don’t really have to plan ahead too much in order to make sure you have some breakfast food on hand. One interesting thing about low-carb high-fat eating is that, once you get started, it turns out that it’s not as much about the food as it is about the appetite. Your appetite is suppressed by the diet, so food becomes more of an afterthought than a driving force in your life. Just make sure you have some healthy options on hand. Take advantage of what you’ve got. There’s no need to buy something special for breakfast. It’s just another meal. But don’t skip breakfast. Just because you don’t feel like eating, that doesn’t mean your body doesn’t need food to stay even and healthy.